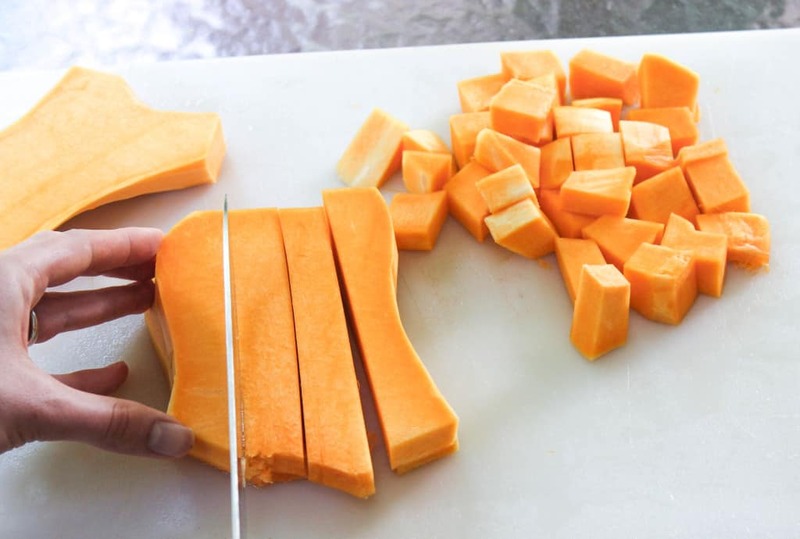 A step-by-step tutorial to peel, chop, and roast your own butternut squash. 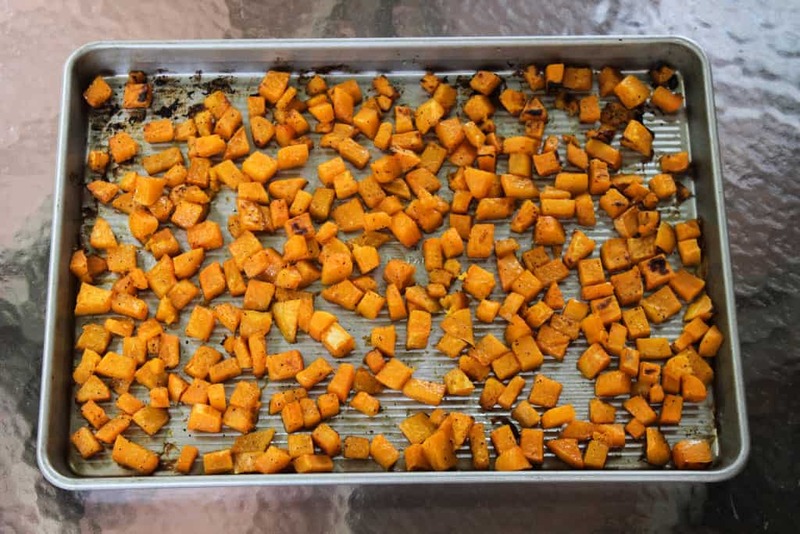 Enjoy the caramelized cubes as a side dish, add to a salad, or puree in your homemade butternut squash soup! I may be a little late to the butternut squash party, but I just found out this year that I really like it. I’ve all but conquered my former distaste for the squash family because I’ve started loving butternut squash, I’ve grown to like spaghetti squash, and I’ve even made my peace with regular yellow squash. Yes! 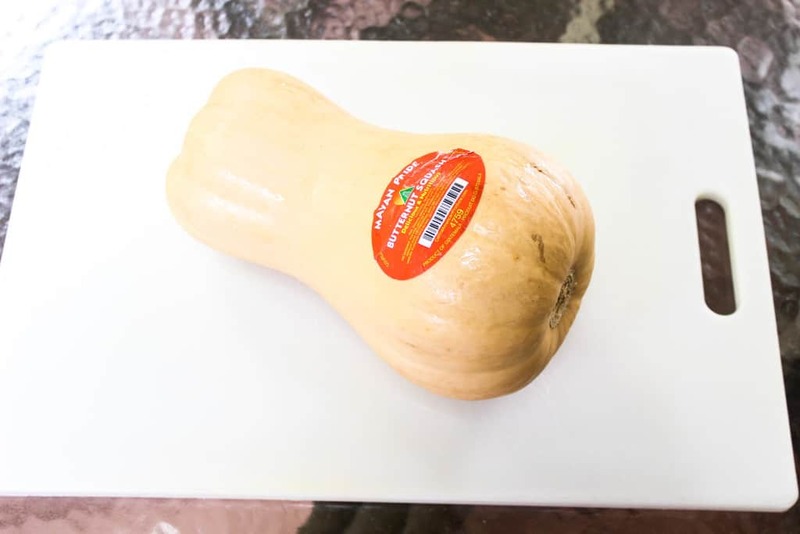 You can buy pre-chopped butternut squash at a lot of grocery stores and I’ve found that at Harris Teeter, packages of chopped squash are actually priced comparably to the whole butternut squashes (weight-wise). At some stores, though (ahem, Whole Foods and Kroger), it’s way more expensive to buy pre-chopped squash and it’s never quite as fresh as chopping it myself, so it may be worth it if I’ve got a few minutes to spare. 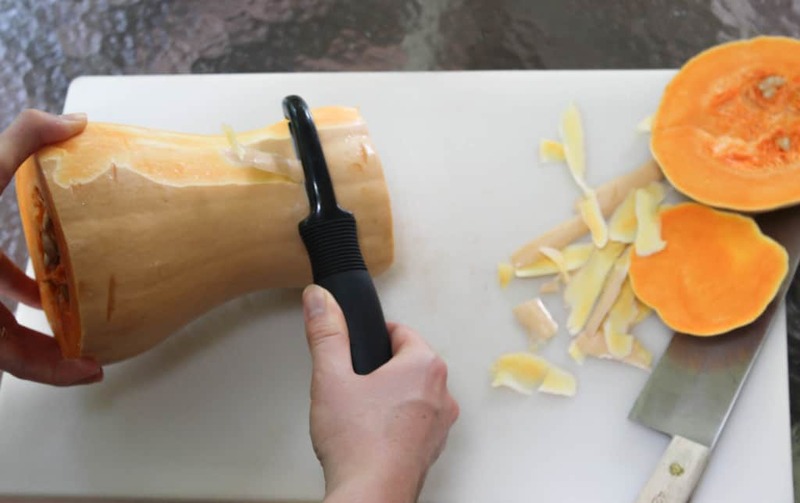 The biggest obstacle to actually preparing butternut squash myself is that it’s a little tough to cut, but this method makes it relatively easy. You’ll need a really sharp knife, a vegetable peeler, and a butternut squash. The bigger the squash is, the better, because if you’re going to put in all of the work to peel it, you might as well get lots of delicious squash out of it! I love adding leftover butternut squash to salads or even eating it cold by itself. To start, place the the squash on a cutting board. This big guy weighs about 4 pounds. Start on the bigger end and cut off the base of the squash about 1/4 inch from the bottom. You want to make a level “base” so the squash will be able to stand up straight on its own. Cut about 1/4 inch from the top of the squash, too. 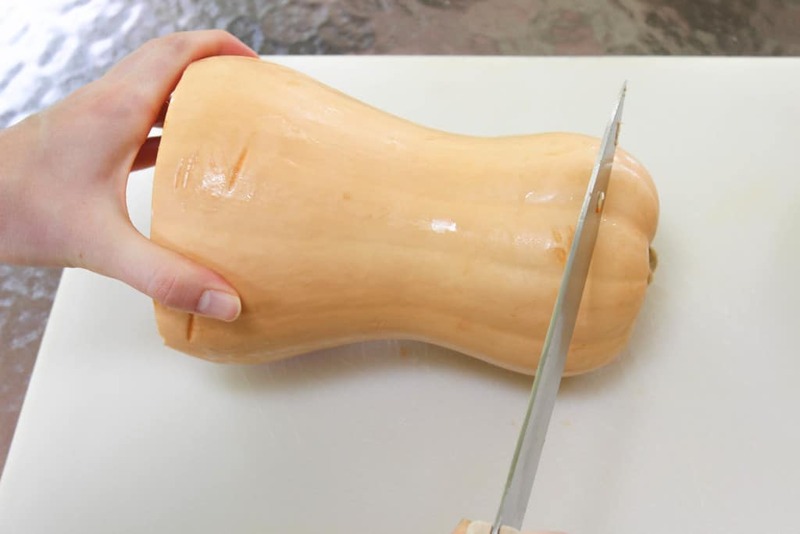 Using a vegetable peeler, peel the squash with long strokes, if possible. You can also stand the squash upright to peel it. Next, you’ll want to cut the squash in half vertically, and this is where it helps if it has a flat, even base so it’s easier to stabilize. Now, it’s time to deal with the seeds and stringy pulp. 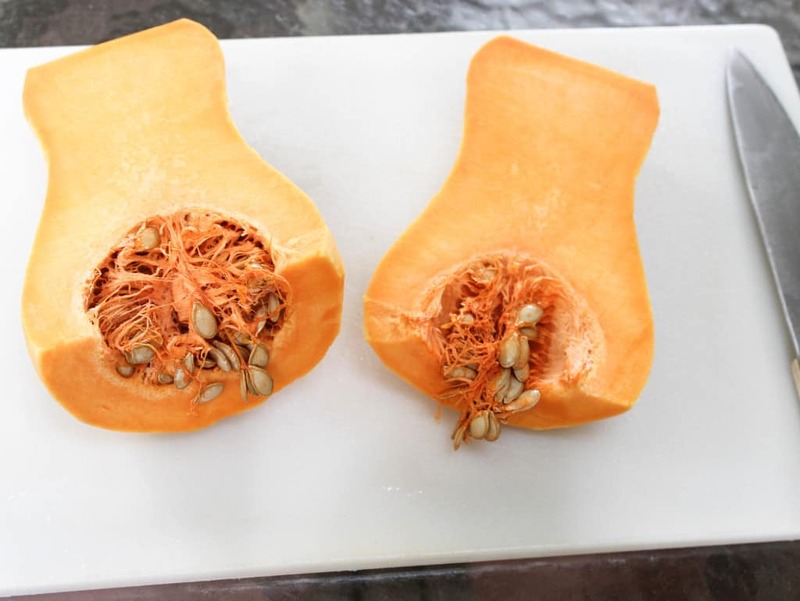 You can scoop the seeds out and roast them just like pumpkin seeds, although butternut squashes really don’t have many. Use a fork or a spoon to scrape the seeds and pulp out. Phew! We’ve made it to the easy part. 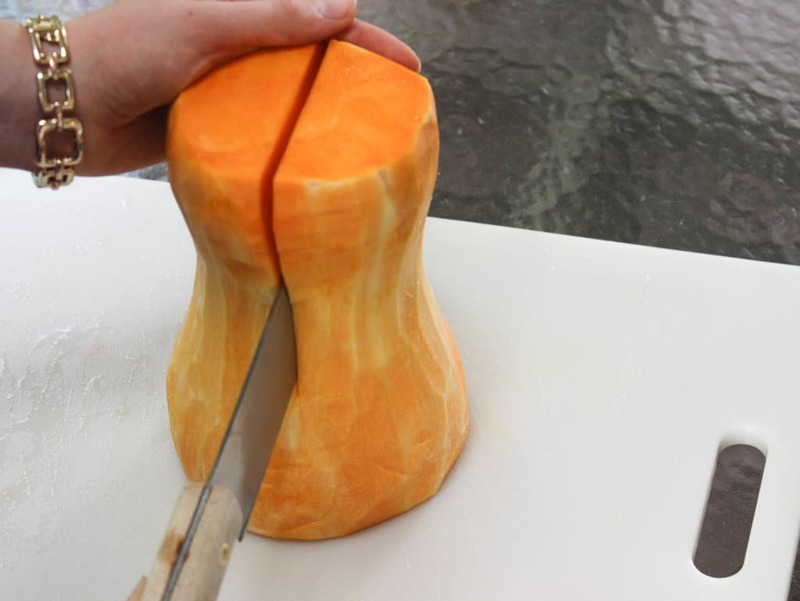 There are two halves of the squash, and you’ll want to cut both halves in half again lengthwise to make them “thinner” halves. Then, you can stack the two halves on top of each other and cut them into matchsticks, and then cut the matchsticks into cubes that are all approximately the same size. Mine were about 1/2 inch cubes. 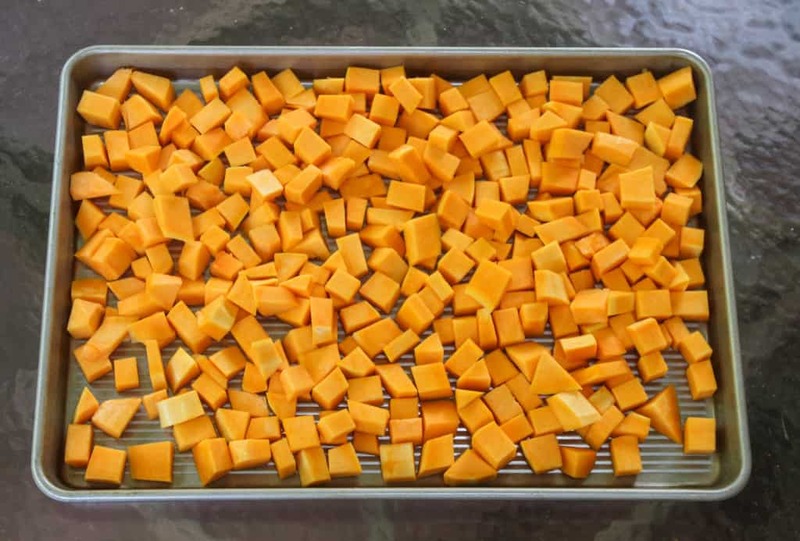 If you’re using a big 4 pound squash, you’ll end up with a baking tray full of squash cubes ready to be roasted. You could also steam them if you’re planning to make butternut squash soup. To roast mine, I drizzled them with a little bit of grapeseed oil since it can withstand high heat better than olive oil can, and then I added a sprinkle of black pepper and salt. Pop the sheet into the oven for 20-25 minutes at 450 degrees or until the cubes are starting to slightly firm up and get a little bit crispy, and that’s it. If your cubes are smaller than 1/2 inch, they may cook more quickly. 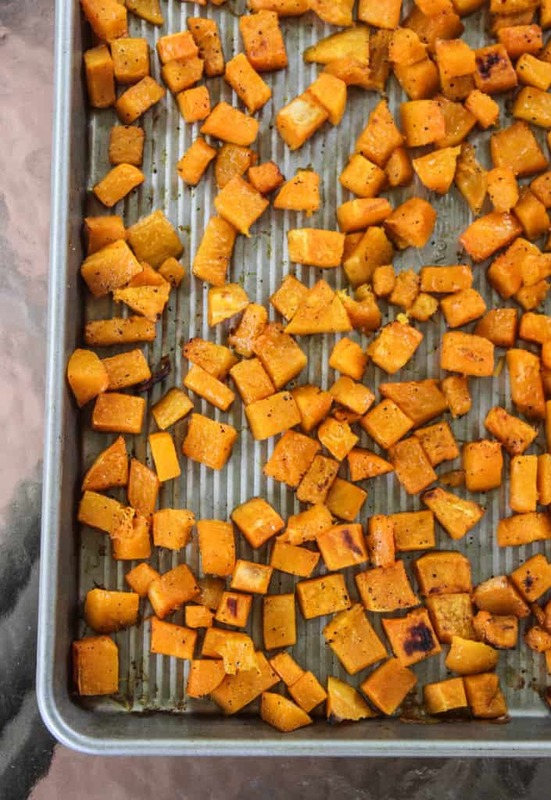 One way to avoid mushy squash is to turn the oven broiler on for the last two or three minutes of cooking while watching it closely to make sure it doesn’t burn. 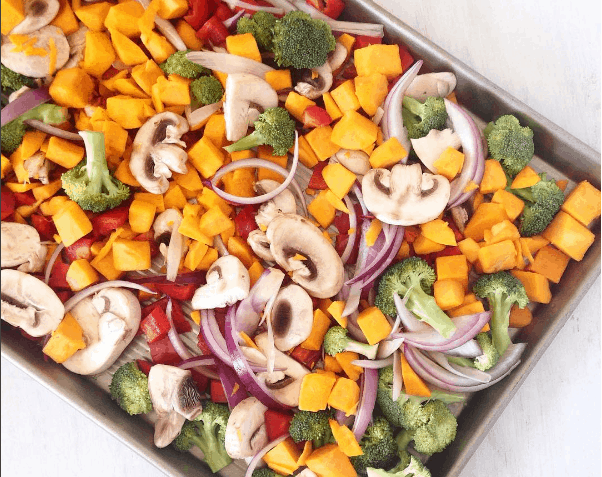 My other favorite way to prepare butternut squash is in a roasted vegetable medley. You can experiment with using different vegetables, but it’s important to make sure they all have similar cooking times. I followed the same roasting method a couple of weeks ago and included red onion, red pepper, broccoli, and mushrooms. The broccoli cooked a little too quickly for the squash and the mushrooms released some liquid while they roasted which made it a little harder for the other vegetables to crisp up, but the roasted bell pepper, red onion, and butternut squash was a killer combo that I repeated again yesterday. If you try the recipe, I’d love it if you let me know in a comment or take a picture and tag me @livbane on Instagram. Hope you enjoy! 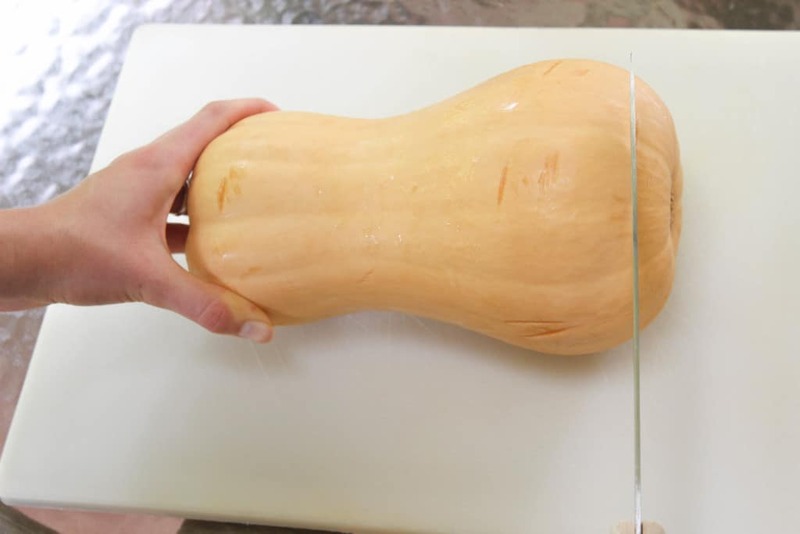 Place the squash on a large cutting board. Start on the bigger end and cut off the base of the squash about 1/4 inch from the bottom. Try to make a level "base" so the squash will be able to stand up straight on its own. Cut about 1/4 inch from the top of the squash, too. Next, cut the squash in half vertically. Use a fork or a spoon to scrape the seeds and pulp out. 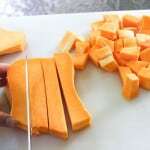 Cut both squash halves in half again lengthwise to make them "skinnier" halves. Then, stack the two halves on top of each other and cut them into matchsticks, and then cut the matchsticks into cubes that are all approximately the same size, about 1/2 inch cubes. To roast, drizzle with grapeseed oil and add a sprinkle of black pepper and salt. Pop the sheet into the oven for 20-25 minutes at 450 degrees or until the cubes are starting to slightly firm up and get a little bit crispy. If your cubes are smaller than 1/2 inch, they make cook more quickly. Optional: turn the oven broiler on for the last two or three minutes of cooking to make squash crispier while watching them closely to make sure they don't burn. How do you feel about squash? What’s your favorite type? I haven’t tried acorn or kabocha squash yet, but butternut’s my current favorite! 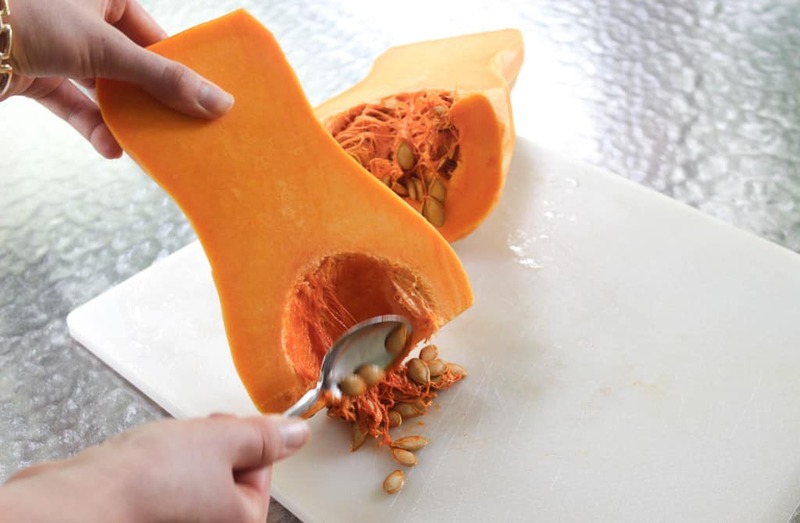 Do you have a great butternut squash recipe you’d like to share? I loveee me some butternut squash 😉 It’s pumpkin season here in Aus (being Autumn/Fall) so I am eating all the butternut associated things! Mmm! Fall is my favorite season for all of the delicious pumpkin and butternut squash! Oh wow, I’ve never cut the top and the bottom off first before peeling it, but that makes so much sense! Butternut Squash is the best! I think it helps stabilize the squash a bit! This is such a silly question, but I really have to ask… there’s a difference between sweet potato and butternut squash, right? Do they taste different? So glad you found it helpful, Jennifer!! You can pop them in the microwave for a few minutes to soften them before cutting! Thanks for the tip, Doreen! I like your knife. The knife looks like the perfect cutter. No doubt! I personally believe that quality sharp knife can be the best tool for kitchen and for cutting the vegetable.